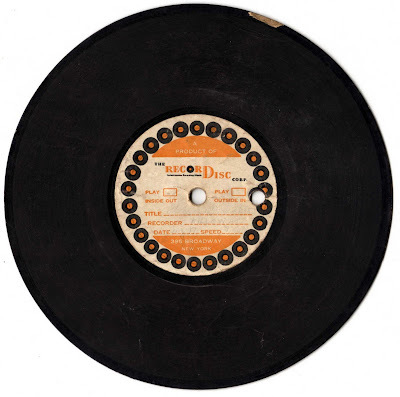 This is a 6.5 inch, fiber-core Recordisc acetate. It is labeled, but in pencil and faded to the point of illegibility. Condition is a bit rough as you can see, but it appears to be a faux-radio show. The Recorder is listed as "Killowatt" and the date at "Aug 17" but without a year. The speed appears to be marked as "SJONA" on one side and "JONA" on the other but in actuality it's around 65 rpm. The title is the same on each side but is equally marred on each side something like 'H---- Broadcast." The writing in pencil is unclear. Phonozoic dates this type of Recordisc the Type 2C to around 1948. I've come across a few of these. They're always great. It begins with "This is the first radio program over GTS, brought to you by the courtesy of ___ downtown supply..." Strangely the DJ claims to be operating on 1350 AM at 2,000 watts. On the B-side they break up giggling and it seems like less of a pro operation. The DJ is a more confident and practiced than most home recordings. I find it possible that this is a recording of a former WGTS-AM or KGTS-AM. It could also be a pirate station, or faux station at a radio school. He even clearly states the transmitter took 20 months to build, indicating some hands on experience beyond the mic. His engineer 'Mr. Carnell' is going off to study radio. This one remains arcane and a bit apocryphal.